Hartland, N.B. 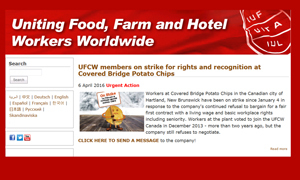 – April 6, 2016 – As the strike by UFCW Canada Local 1288P members at Covered Bridge Potato Chips holds strong, thousands of activists from around the world have added their voices in calling for a fair first contract at the snack food processor. This week, the IUF – an international federation of unions representing over 10.5 million members in the agriculture, food processing and hospitality sectors – launched an online campaign alerting a worldwide audience to the flagrant disregard for the human, labour and collective bargaining rights of the members at Covered Bridge. The campaign, in one day alone, generated thousands of letters from activists, demanding that the owners of Covered Bridge get back to bargaining. Members at Covered Bridge Potato Chips have been on strike since January 5, after company continued to refuse bargaining for a fair first contract with a living wage and basic workplace rights including seniority. Workers at the Hartland plant voted to join the union more than two years ago. Since then, the company has violated the province's Labour Act five times, and has been ordered to stop intimidating union supporters. The IUF efforts have added to the impact Campaign for Fairness at Covered Bridge, which has already gained tremendous public support. A leafleting, web, social media, and radio campaign across the Atlantic region has cut into sales of the chips, as more and more consumers, retailers, bars, restaurants, and campuses have refused to purchase Covered Bridge Potato Chips until the strike is over. Thousands of letters and emails continue to flood into Covered Bridge and government officials, supporting the strikers’ call for a fair first contract. 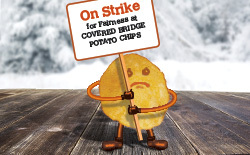 Add your message of support to the Campaign for Fairness at Covered Bridge Potato Chips by visiting ufcw.ca/coveredbridge.